I randomly decided to list the shows my friend Matt and I had attended over the years and then it just seemed natural to finish the job. This mainly satisfies my need to list/organize things, and it's a nice trip down memory lane as well. I've been pretty good about keeping ticket stubs over the years but there are a few omissions here and there. I have actually gone to the trouble to try and find ticket stubs on Ebay and I managed to get stubs for Journey (my first show), Van Halen on Diver Down, Ozzy on BATM (also saw him at the Texas Jam on that tour, for which I still had the stub), and Dio from Last in Line. Why these particular stubs were lost is a mystery as I have most of the shows I've ever seen. I'm still trying to get several other stubs but the pickings are quite lean in that department. I actually bought ticket type paper and need to get around to recreating a few of the missing stubs. There have been a few shows I've attended on will call that they just don't give you a stub by policy or on occasion a ticket printer wasn't working. *reliving past shows is the gift that keeps on giving. Last week was a reasonably successful week from a songwriting standpoint. I had to write a song for my acoustic guitar class final, so I endeavored to write and record the song/video within that one week. I had noodled a simple counterpoint idea (my first) on the keys a few weeks before and thought that might be useful. I ended up using that as the chorus and in short order came up with a basic chord progression for the intro, verses and chorus. It's a really simple tune in that sense, basically in A minor with occasional non diatonic wanderings. I ended up also coming up with a harmony line for the chorus melody and that's definitely an area I intend to explore further. Lots of untapped potential in counterpoint and harmony. I'm taking a basic rhythm section arranging course next semester, but I'm planning on taking a counterpoint course in the future. Since recording the instrumental version of this tune, I was inspired to pen some lyrics and so now I plan on recording a version with vocals in the near future. This tune was a nice surprise because I actually had people talking about how the song made them feel, which is a first for me. That's really the point, though. Causing an emotional reaction with music is all I can really hope to achieve. Complex and impressive arrangements are fun and I'll pursue those tunes as well, but as a listener I'm always drawn to those songs that make me feel something. I have loved all the technical players I've seen live, but nothing has connected as strongly as a show like David Gilmour, Father John Misty, or Tommy Emmanuel (he straddles that line, but it's his simpler and more emotive tunes that mean the most). Resumed working on a long dormant riff that I've actually had for many years. I put together a basic structure of the song several months ago (I think). I'm not sure when I got the time to patch together this very rough cut but the arrangement was pretty close to how I intend to keep it. I laid down several passes at the various parts on the Les Paul. I think I understand how many bands prefer to demo songs while on tour before they hit the studio to record them. Just messing around with the song for a few days has brought new ideas, plus it's helped the performance with the extra practice. Yesterday, my intent was just to get all the rhythm guitar parts finished and then maybe double track those with my Strat. I got sidetracked during the solo part and went ahead and started making some passes at that. I built on a solo idea I'd had started when I put together the first rough cut. I like the structure okay, but I need to practice it and I'll probably make a few tweaks to it before it's done. I played it on my Les paul, but I may try it on the various guitars to see if I have a preference. After I've got a decent rough demo of the guitars I'll work on the bassline. Perhaps counterintuitive to how many songs are put together, but this song was written on the guitar so I decided to work on that first. I'm going to try and write and perform on the actual bass guitar this time. The last song was all written in midi and I never played the bass on it. This song is essentially just guitars, bass and drums. I'm leaning towards writing vocal melodies and lyrics and that will be the next big effort. I posted a lyric video of my recently a̶b̶a̶n̶d̶o̶n̶e̶d̶ completed song, Widow Black Unweeping. I decided to leave it as is, and although the mixing/mastering could probably use another set of ears I'm leaving it for now so I can focus on new music. I'm wondering if I'll eventually revisit some of these tunes in the future and re-record them from scratch. Possible, but not sure I want to go to that much additional work. I need to just keeping churning out new songs because I'm learning the process for all steps, not just the core of songwriting. Considering the end result, this song took entirely too long. I've heard Steven Wilson remark that if he can't finish a song in one day, he loses interest. That's an oversimplification since he's not talking about a completed song ready for release, but I imagine his demos still sound pretty amazing. I'm going to strive to streamline my process. I decided during the last song that I want to try the writing/recording on Studio One and then send it to Pro Tools for mixing and mastering. Part of this was frustration with the Pro Tools interface and monitor management. Ironically, I've settled into a decent workaround for those issues that doesn't take too much effort so it may not be as critical. I'm still going to give it a go for the next tune and weigh the pros and cons after. I'm a fan of Studio Ones monitor management and that it can be altered for each song. There are still so many DAWs out there I haven't tried. I've wondered if Ableton Live, Cubase and a few of the other major players would offer me something I'm missing. My feeling is no, but the grass is greener, yada, yada, yada. I tried Reaper and it just wasn't working for me. Granted, I didn't put much effort into learning it. I really did like Logic and Final Cut on the mac, and if Apple releases a compelling desktop next year, I'll definitely consider using them again. Luckily PT and Studio One are cross platform so I could continue using those. 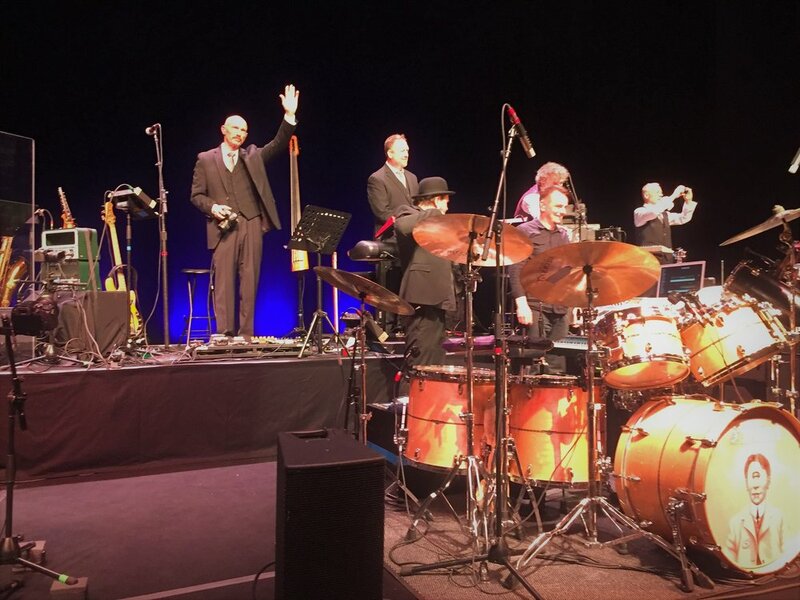 A theater unto itself, a King Crimson concert is a humbling display of power, precision, and passion. At times subtle and delicate, but unfailingly relentless and implacable all the while. I sat in bewilderment, my attention passing quickly from musician to instrument and back again, barely able to keep up with their performances. Moving from joy to sadness, from confusion to clarity, from gobsmacked to gleeful, I was blown away by this night. These world class musicians were a sight to behold and brought a wondrous spiritual rhapsody, of a kind I've never quite witnessed before. Thank you, gentlemen, thank you indeed. It was truly one of the most powerful shows I've ever attended, and judging from the audience response (a standing ovation after nearly every song) they felt the same way. I managed to sneak my way into Tony Levin's blog post about the show as seen in these photos. August is winding down, but we're still stuck in the middle of the sweltering season. Here in the south that typically runs year round with a few months break that we affectionately refer to as "Winter" but can include temps in the 70s and even 80s. At some point in my lifetime, this is probably going to just change to Summer Light as we will have done away with any temperatures remotely resembling winter. I got the 65 Amps cabinet and installed it in my now nominal amp iso room (closet). I don't have the setup totally settled just yet. I'm putting an iso pad like I have for my subwoofer in the home theater to minimize the low end. I'm debating whether to place a few of my bass traps in there as well. I need to engage in some cable management for that room as well as where I have the amp head in my control room. I gave the setup a few run throughs and my basic impression is that it sounds wonderful. I just very basically placed the two microphones and haven't taken the time to adjust their positions to find the best sound. I'm getting a Dynamount system to make this process much easier. The Dynamount is a "robot" controlled mounting system for microphones that allows you to move the microphone through 2 or 3 axes depending on the model. You can mount it horizontally or vertically and this gives the choice of horizontal, vertical or proximity as well as rotation. I'm probably going to go with the proximity option (you have to choose between having the robot system flat or vertical and this determines if you'll get the vertical or proximity option). My 65 Amps cabinet is a 1x12 so I'm pretty sure I'll get more tonal variety out of proximity than vertical. Right now I've just gotten the one system and I plan to use it for the Royer 122. I'll likely add a second system in the future. High Productivity is Celebrated...until it isn't. In an ironic twist to my elevated productivity as a fee basis examiner, I had his supreme indolency take the trouble to drop by my office and let me know that my increased numbers (which had necessitated a salary waiver as I had hit my max after five months) had raised a few eyebrows. Although he was attributing it to "someone pretty high in Dallas" (high, he he), I'm sure most of it was coming from him. I reacted immediately (as I usually do, sometimes to my detriment) by telling him that I would welcome anyone who wants to take a close look at any of my work/exams and let me know what's lacking or inappropriate. I know my exams are complete by VA standards and I also know that I don't perform exams unless they're requested or justified in the case of a recently discharged veteran who requests to add a few more claims. As I explained to dicktug, I'm preferentially getting these bulk Gulf War exams which typically include 10+ actual claims and then an equal number of medical opinions for each claim. This can very quickly run my daily numbers to 20+. He made some sort of brief comment about his ability to generate those numbers which I just ignored because this jackhole was one of the examiners that weren't breaking 40 exams in a month. I've done more than that in one day. I also explained to him that I often take on other examiner's work because they call in sick or because they can't be bothered to complete opinions or equivalent. Our admin staff preferentially asks me to do these types of exams because I don't argue with them or make them feel bad for asking. Many of the regular Federal employees are downright adversarial to the people who are just trying to do their jobs and help veterans. When I was a regular Federal employee I had the second highest (out of 20ish examiners) productivity in the clinic. Now as a fee basis, I think it's possible I'm the highest, but I haven't been looking at the clinic numbers anymore. I'm definitely generating higher per day numbers as it's not uncommon that I get 25 or more exams in a day. I assume part of his problem is that my elevated productivity makes the glacial examiners look even worse by comparison. I'm not sure if the current scenario can be sustained, but I'm hoping things will move slowly as they do in the Federal government. I'm also hoping that we'll continue to have our minimal producers occupying full time slots which will in turn keep the demand up for fee basis examiners like myself. I think he is offended by the situation in which a lowly PA like myself (in his eyes) can earn an equal income to his while working significantly fewer days and not having to deal with a lot of the regular federal pain (actually my total is probably greater considering my other incomes). I've met several doctors like him in the past that seem to think they have earned a perpetual income just based on their diplomas and not based on any work they're doing now. The good doctors (most of them) judge other providers on their own merits and don't make assumptions based on degrees held. We've never heard them express concern that we have doctors earning huge salaries while doing little to no work. The VA has a prevalence of these types, I think it's one of the primary attractions to the job. A repeating theme I've learned over the years of practicing is that learning new material is one of the most rewarding aspects to musicianship. This is especially true if it's something I'm learning by ear. One of the biggest challenges has been to sound out harmonically complex piano music. I'm guilty of always looking for a sheet music version of something but there are still several tunes or at least versions of tunes I love that have never been offered as sheet music. This is especially true on live arrangements by artists like Rick Wakeman and other improvisers. I'm trying to make it a regular part of my practice to incorporate learning new material by ear, at least on piano and guitar. These skills only improve through repetition, and although it's very incremental and almost impossible to discern at times, I do notice a gradual improvement. I suppose this would be ostensibly for the ultimate goal of becoming a better and more rounded musician, but I've also always felt immediate satisfaction for even the smallest bits of a new song I'm learning. Learning a new song for me feels like tapping into the mystical, almost. It's the muggle equivalent of learning a new spell.